A Large Spotted Eagle Ray Sculpture ready to be hung in aquarium parks, commercial establishments, themed events, restaurants, and more! 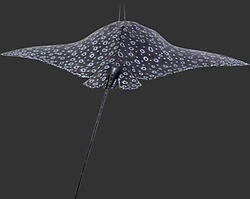 The Spotted Eagle Ray is a tropical fish commonly seen alone but occasionally with a group. It's dark ventral surface is covered in white spots or rings. Known to commonly eat small fish and crustaceans and frequently searches the sandy seabed for food. 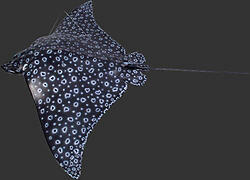 Beware the Spotted Eagle Ray's base of tail which carries several venomous stingers! Not to worry though, this fish sculpture is made from durable materials using cast resin mold mixed with fiberglass and hand painted to the highest detail. 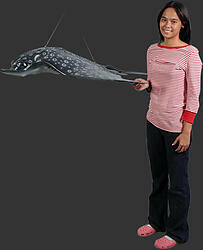 A great addition to your fish decor!